Glovius apps now available on Amazon Appstore for Android! Today, I am pleased to announce the availability of Glovius Lite & Glovius on the Amazon Appstore for Android. Glovius Lite is a free, high performance 3D viewer for Amazon Kindle Fire and other Android Smartphones and Tablets. With Glovius, showcase your 3D models on the go. 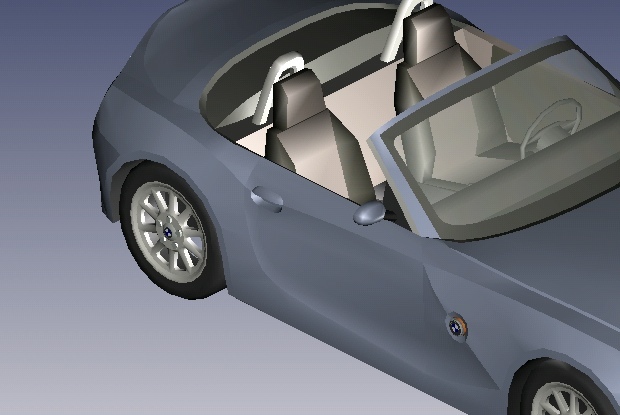 Interact with your 3D models using the intuitive touch interface. Pinch to zoom, single finger drag to rotate, two finger drag to pan and double tap on the screen to reset the model. A few sample models are shipped with both apps to get you started. To download models on your device, create a free account on Babel3D.com. Upload your SketchUp, 3DS, OBJ, STEP, IGES, JT, CATIA V5, ProEngineer, NX, SolidWorks, Inventor, STL files and select “Mobile” as output format. Now login from within the Glovius app to download. SketchUp, 3DS, OBJ, STEP, IGES, JT, CATIA V5, Pro/ENGINEER, NX, SolidWorks, Autodesk Inventor & STL file formats are supported. You get 10 free translations when you register at Babel3D.com. Subsequent translations are charged at $0.99 per file. With Glovius, take simple sections across the standard XY/YZ/XZ planes, move & flip the section plane. View the product structure and hide/show PMI data (wherever available). Save & Email snapshots of models. Open Glovius models from email, SD Card & other applications and view standard top/bottom, left/right. front/back & isometric views of your model. Android 2.2 (Froyo) and above are required to run the apps. Do write to me at sid@glovius.com with your feedback and suggestions!